The formation of long-term memory is a protein synthesis-dependent process. The identity and functionality of the proteome that is newly synthesized during LTM formation is not well understood. Our research objective, therefore, is the characterization of the learning proteome. 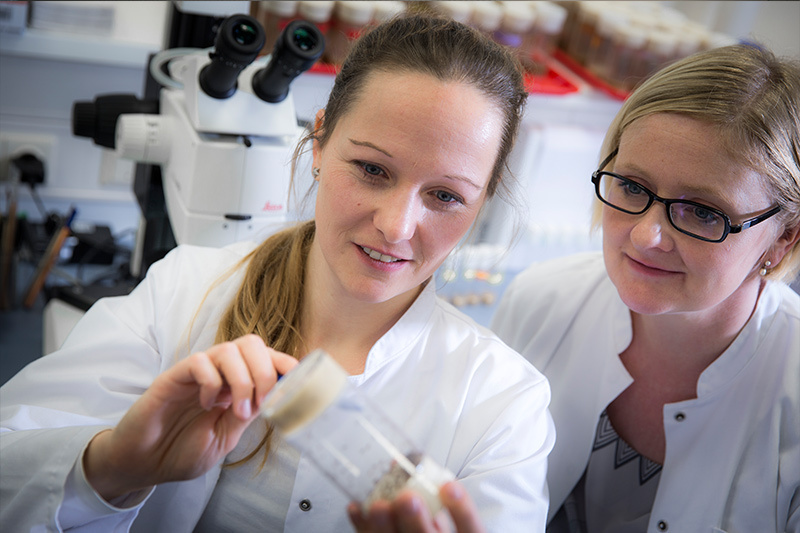 We address the description of the Drosophila learning proteome with state of the art techniques developed by Dieterich and colleagues. BONCAT (bio-orthogonal non-canonical amino acid tagging, Dieterich et al., 2006; Dieterich et al., 2007) and FUNCAT (fluorescent NCAT; Dieterich et al., 2010) employ artificial azide-bearing amino acids (AA) that incorporate into newly synthesized protein surrogating the natural AA methionine. Due to their azide-group they can, via a copper-catalyzed 3+2 azide–alkyne cycloaddition (“click chemistry”; Rostovtsev et al., 2002), be tagged with an alkyne-affinity tag (BONCAT) or with a fluorescent tag (FUNCAT) and subsequently identified using mass spectrometry (BONCAT) or visualized (BONCAT & FUNCAT). Furthermore, in order to exclusively label proteins in specific tissues we developed GINCAT (genetically introduced NCAT) in Drosophila (Erdmann et al., 2015). GINCAT employs the artificial azide-bearing AA azidonorleucine (ANL; Link et al., 2006; Tanrikulu et al., 2009). The endogenous translation machinery cannot realize incorporation of ANL as a surrogate for methionine into proteins as ANL’s azide-bearing side chain is too long to fit into the AA binding pocket of the wild type-MetRS. By using a single amino acid mutation (LeucintoGlycin) in the methionine binding pocket we were able to successfully incorporate MetRSLtoG constructs into the Drosophila genome that allow ANL incorporation under the control of the upstream activation site (UAS). 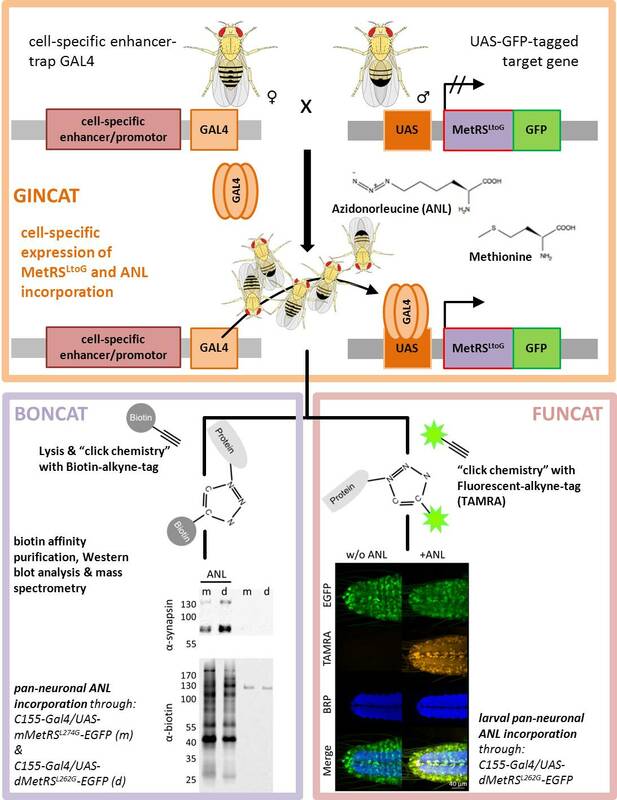 The generation of these transgenic flies allows targeted expression of MetRSLtoG and, as a consequence, ANL-incorporation into proteins of selected Gal4-driven cell types in living Drosophila after events such as learning and subsequent visualization using FUNCAT or biochemical analysis and mass spectrometry using BONCAT. Erdmann I, Marter K, Kobler O, Niehues S, Bussmann J, Muller A, Abele J, Storkebaum E, Thomas U, Dieterich DC. (2017) Cell Typespecific Metabolic Labeling of Proteins with Azidonorleucine in Drosophila. Bio-protocols. highly soluble caged compounds. ChemistrySelect.